Awarded Champion Golden Ale at the Great British Beer Festival in 2014, this is a single hop beer using only 'Citra' hops. It's a light, exhilarating beer with pungent grapefruit, lychee and gooseberry aromas. Tropical flavours continue on the palate and lead to a robust bitter finish. Great with Thai food or spicy tacos. Zesty hoppy citrus. Hopped with: citra.Light gold in colour, bursting with citrus and tropical hop flavours and sensationally refreshing. 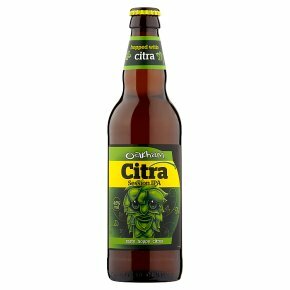 The original UK Citra.